Wellness in today’s world can mean many things to many people. For some, it relates to medical and health services; for others, it is an expression of a positive lifestyle or spiritual mindfulness. Who says scrap is useless? Slate-ish is a tile product made in the US from 100% post industrial waste reclaimed from the fabrication of paper-laminate products which are normally used for countertops (Richlite and PaperStone), skateboard ramps, bathroom partitions, lockers and more. 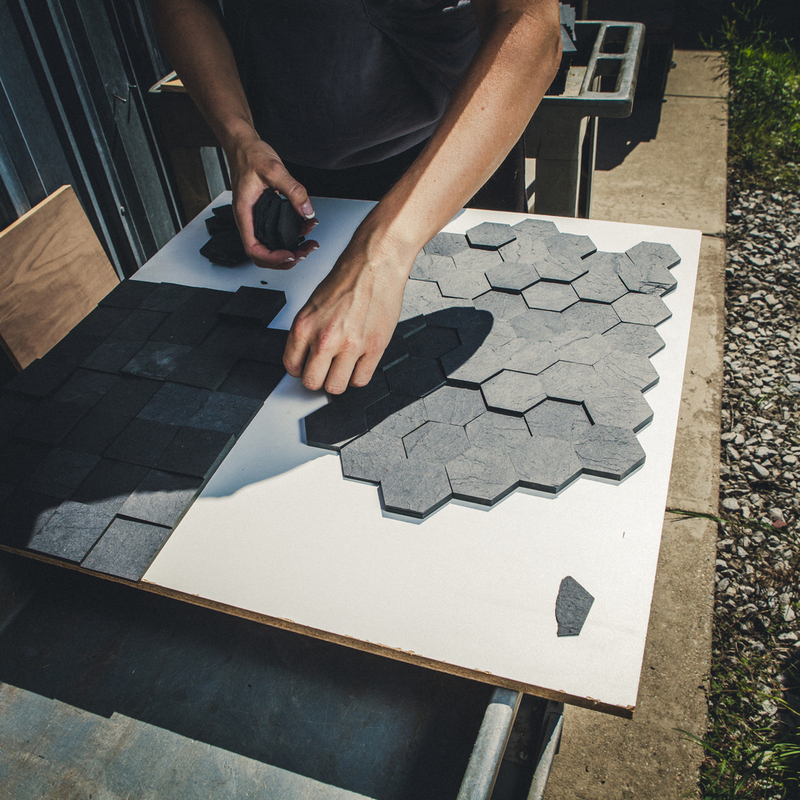 The scraps are cut into various geometric shapes, and hand-split to create a tile that looks like slate. 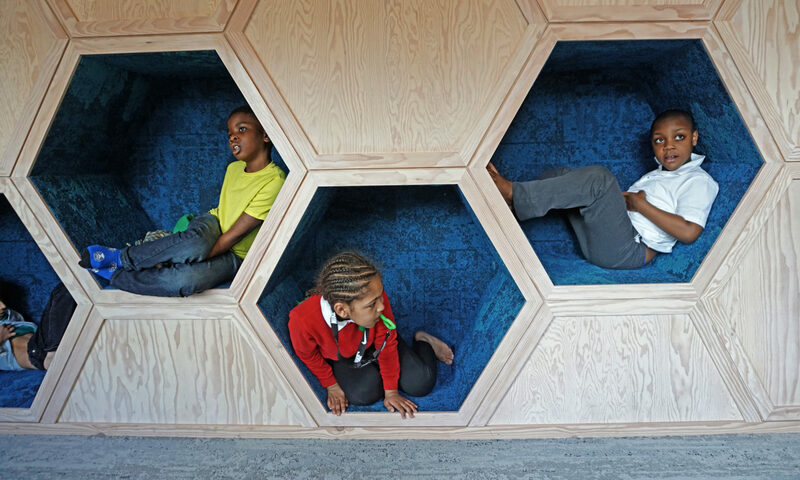 Six shapes are available from Slate-ish: Hex, Tri, Square, Para, Stud and Strip. The tiles are sold loose or as custom mounted panels. 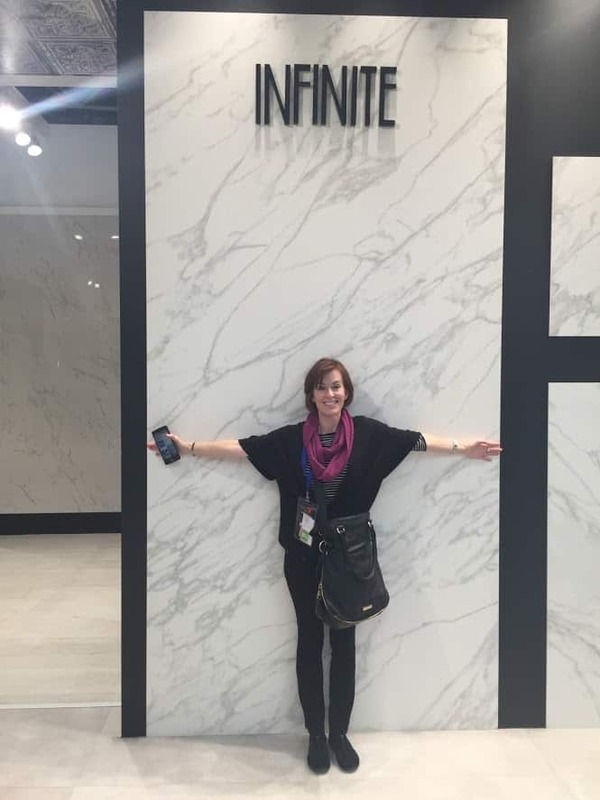 Tile depths vary from 1/8″-1/4″ and weigh 7-1.2 pounds per square foot. Four colors are available: Soot, Bark, Chocolate and Earth. The color of the tile will vary slightly from piece to piece, and from batch to batch. Soot is considered the most consistent color, but mixing tiles during installation for a more uniform look is recommended. 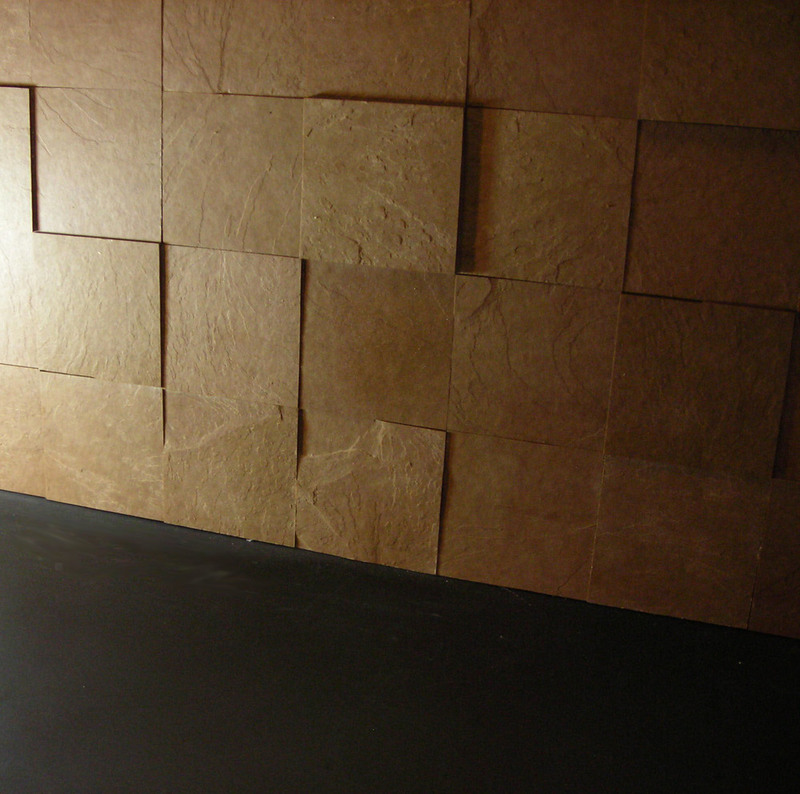 The tiles can be sealed to protect and deepen the color, but it is not required. 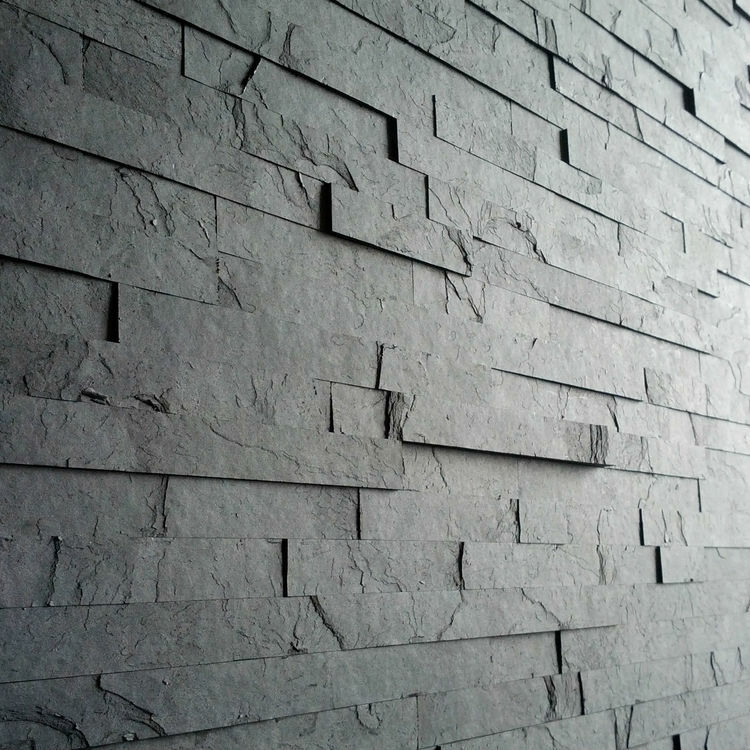 Slate-ish, which resembles stone tile, is appropriate for interior use and weighs a fraction of the weight of natural stone, making it ideal for unique installations. 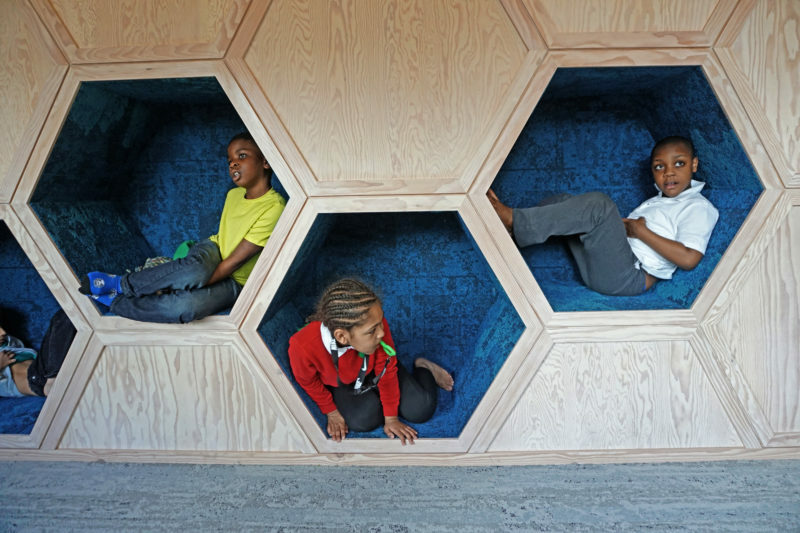 – such as feature walls, fireplace surrounds and even ceilings. While most choose to install Slate-ish in a dry-stack method, you can opt to install it with space and grout like standard ceramic tile. 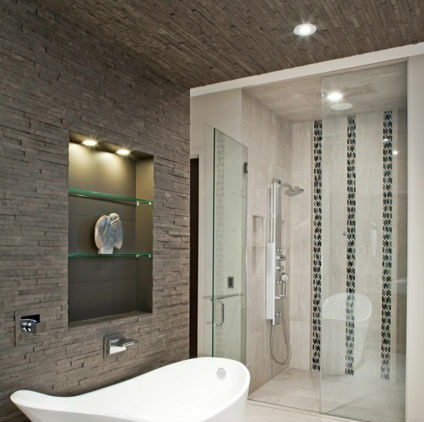 Slate-ish tiles are impact resistant and at least 6 times stronger than natural stone. 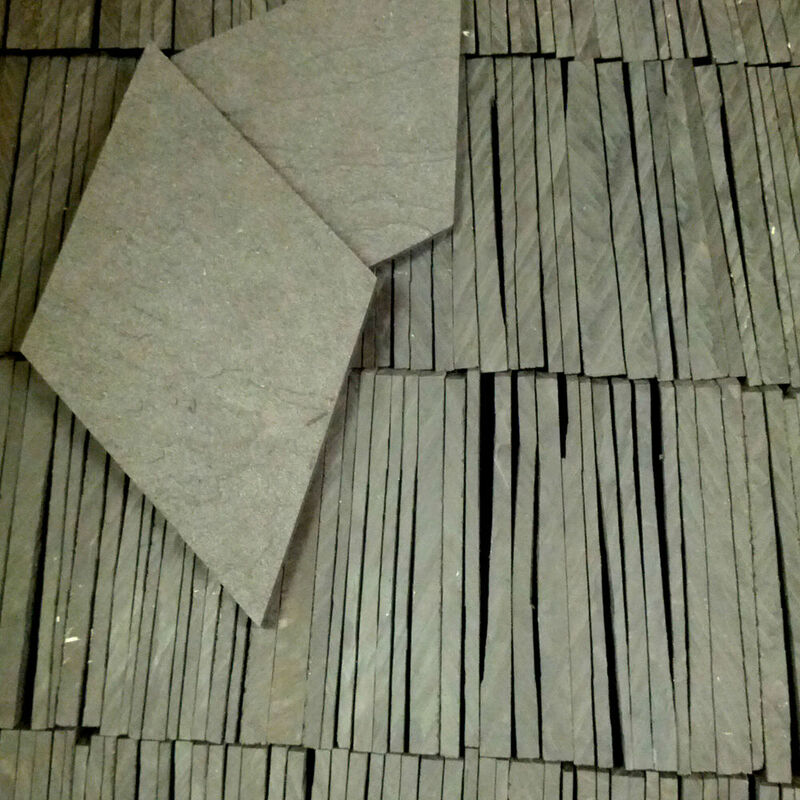 Slate-ish is non-porous and available with Class A fire rating. The tiles start at $20 per square foot. Slate-ish has been busy sourcing new materials to add to their line. Look for new offering such as large format tiles in the near future. 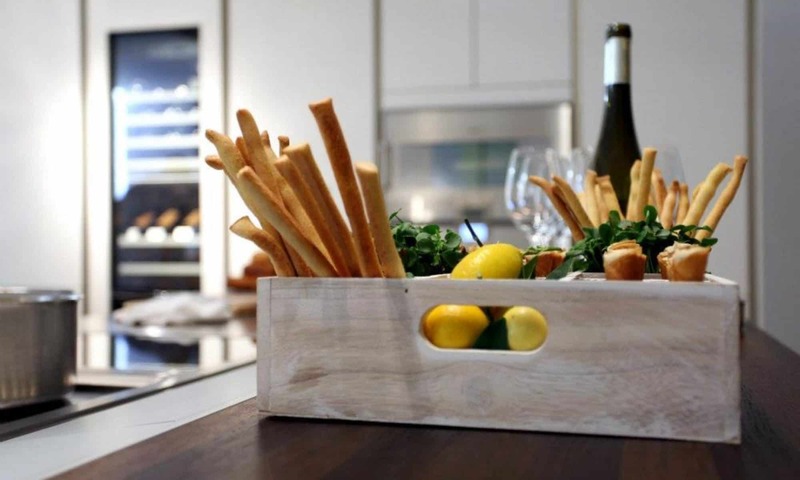 Demode is offering material doors in their Meccanica Kitchen line for a modern “dematerialized” aesthetic. Created by Gabriele Centazzo and engineered by Valcucine, the Meccanica Kitchen uses less materials in its construction thus creating a revolutionary eco-friendly kitchen system. The Meccanica Kitchen is characterized by tubular iron (anodized aluminium) frames that create different modular elements which can easily be assembled and dismantled as needed, customizable to any space in the home or office. The tubular pieces are joined with mechanical fasteners so there is no gluing or worry about formaldehyde. 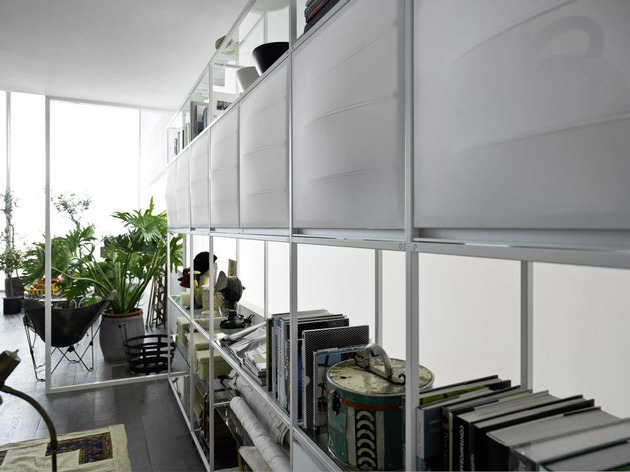 Shelving, drawers and panels can be added into the metal framework in a variety of different finishes. Doors are available in various colors of plywood, sheet metal or even fabric which is stain-resistant (Teflon-coated), removable and washable. Meccanica has been designed to be 90% reused and 100% recycled. 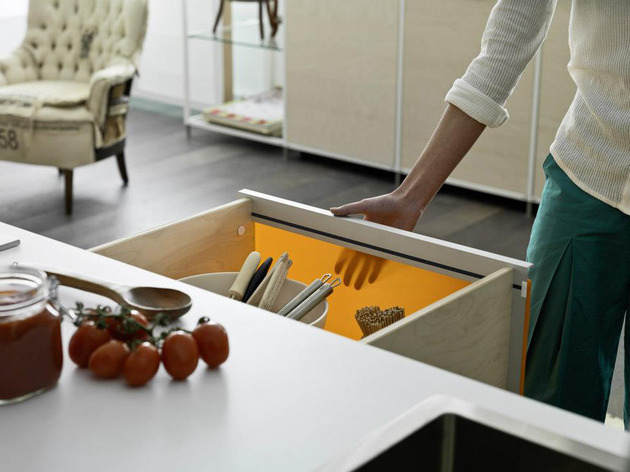 It comes with the Valcucine Life-long Responsibility Guarantee, which ensures that they will take the kitchen back at the end of its life cycle. The units are shipped flat-packed allowing for more items to be shipped at one time, reducing transportation and fuel costs. DEMODE by Valcucine redefines a new parameter of the real living culture with real beauty that is simple, intellectual, engaging and unique design purpose. Demode stands for Democratic Modern Design. A name that can also be read as Démodé, i.e. out of fashion. Why? Because fashion is ephemeral while Demode is designed to last. 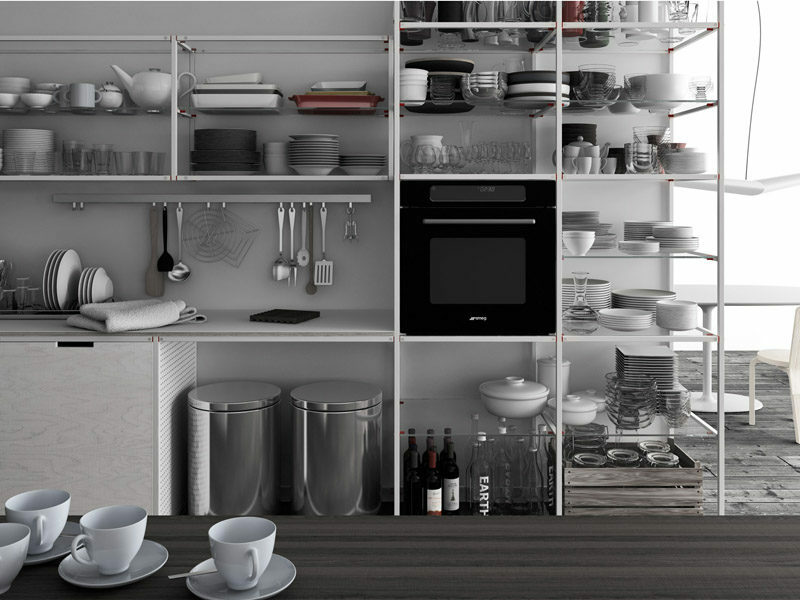 Meccanica is the 5th Kitchen Series for Demode, joining Digma, Planca, Integra and Forma. 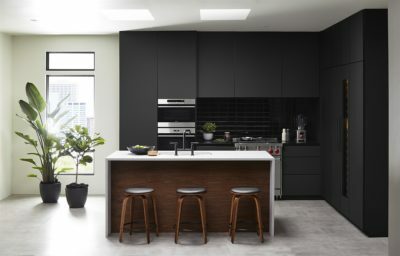 Traditionally associated to the idea of reducing consumption (degrowth philosophy), Demode kitchens embrace minimum consumption of raw materials and energy, long durability, recyclability and non-toxic finishes. Each product is 100% recyclable, designed for reuse, optimization of raw materials and application of non-toxic processing and materials. 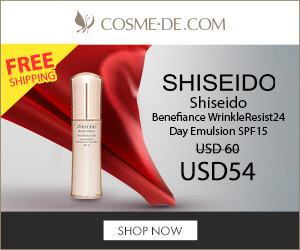 Demode does not advertise in magazines or on television so they can price their products at a proportional value for the consumer. 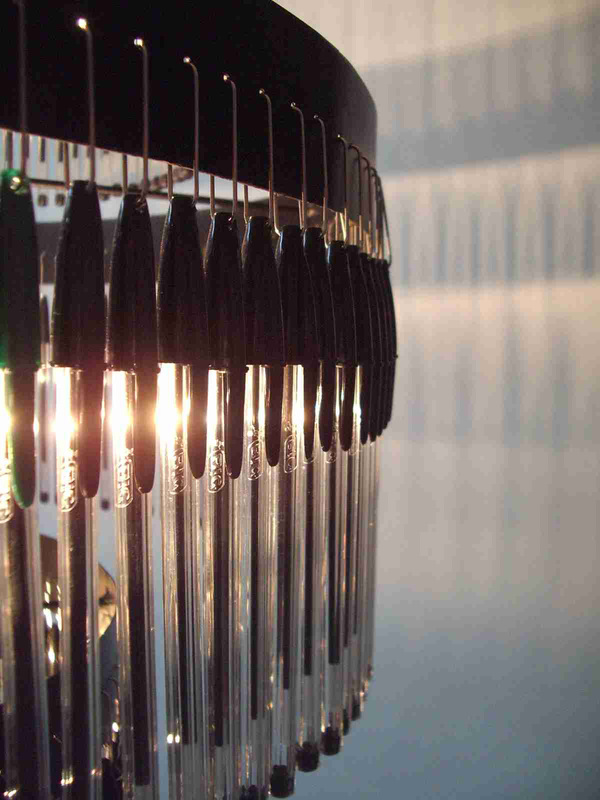 This fabulous chandelier made from 347 Bic Cristal pens and 347 paper clips. It is on display at the Science Museum of London as part of the exhibit Plasticity – 100 years of making plastics. The exhibit celebrates the ingenuity involved in creating “the first truly man-made material,” as well as its modern substitutes, while looking at the environmental implications of this discovery and plastics’ subsequent spread around the world. 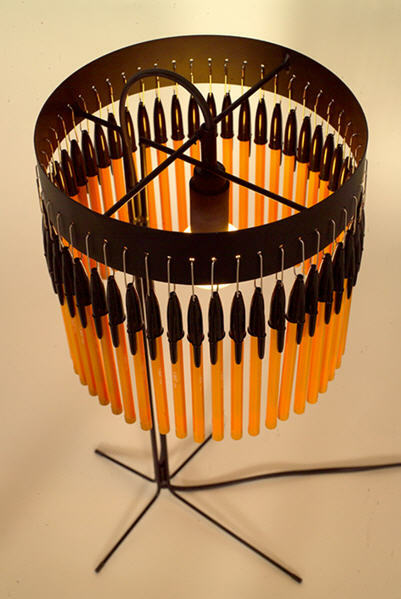 The Bic Biro Chandelier was made by Spanish design company enPieza Studio. 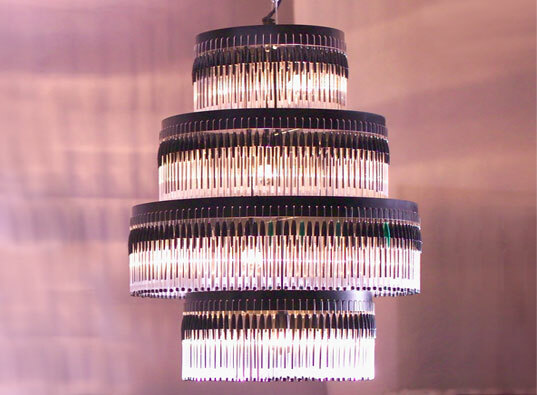 This is not their first light made from recycled pens. 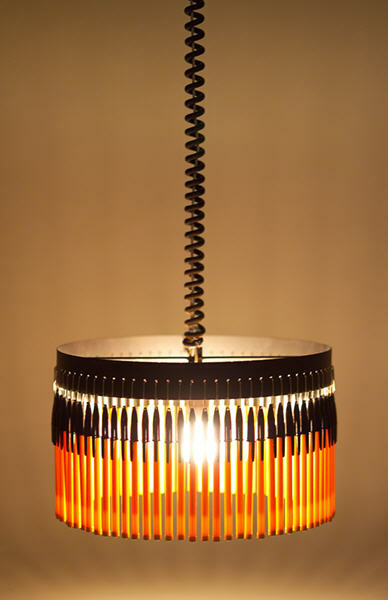 They have created a table lamp named the Volivik 50 from various color Bic pens and the Volivik 77 pendant light from orange pens. The chandelier reminds me some of the chandelier made from plastic coffee stirrers that I mentioned a while ago on KitchAnn Style. The pens in the close up view also seem to be full of ink so I am not sure they were not purchased solely to make the lights.